What a difference a week makes. In the span of a short seven days, the weather did a full 180, rendering my two cross-country ski races completely different affairs. As the Mora Vasaloppet approached, the weather forecasters had dire predictions for severely cold weather. I held out hope that in time the atmospheric patterns would change and deliver us from the promised deep freeze. But it wasn’t to be. The night before the race, temperatures dipped to -15. Packing for our early departure to drive to Mora included every warm layer I owned for skiing. And I mustered my courage for a frigid race. Gathering in the Mora high school auditorium, we were surrounded by racers donning all manner of protection. The best were the moleskin patches custom made for faces, sporting brilliant patterns. I never knew such existed! Rich and I carefully scrutinized and selected our layers, then headed for the start line. If it had to be cold, the sunshine rescued the day. Its brilliant rays shone in a deep blue sky throughout the race. Combined with the right clothing and plenty of hard skiing, I felt impervious to the cold throughout my 48 kilometer race. Because of the low snow conditions, the usual point-to-point route was reduced to 12k laps. The race crew did a phenomenal job grooming what little snow they had, and the cold temps reduced it to a squeaky cold and fast crust. Looping four times around the course delivered an entirely different feel to the race. While the fastest skiers are normally long out of site from my middle of the pack position, in this case they were soon lapping me – the fastest doing 2 loops to every one of mine! As soon as I’d hear the rapid squelch of approaching poles, I knew enough to move to the side to let them fly past. It proved rather unnerving, at times. 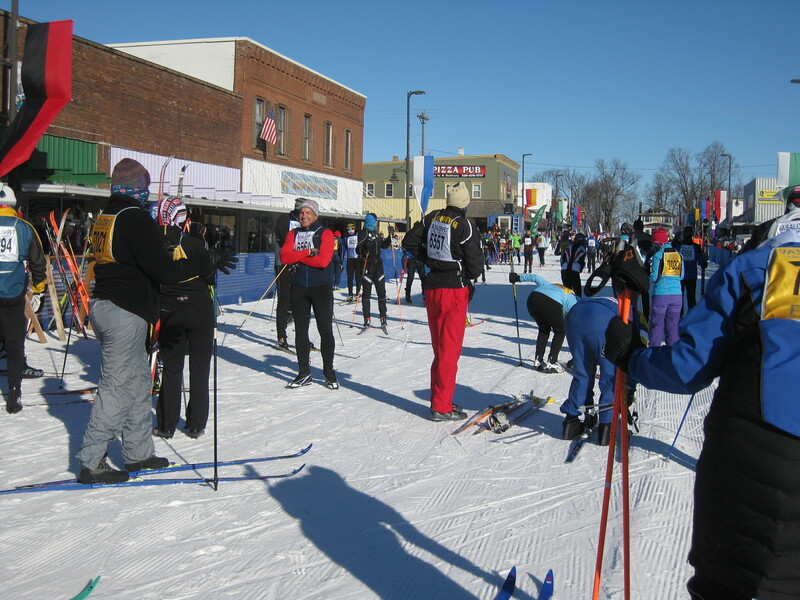 But on the other hand, there was almost a carnival atmosphere, seeing skiers passing in various directions as the course curved and turned back upon itself. 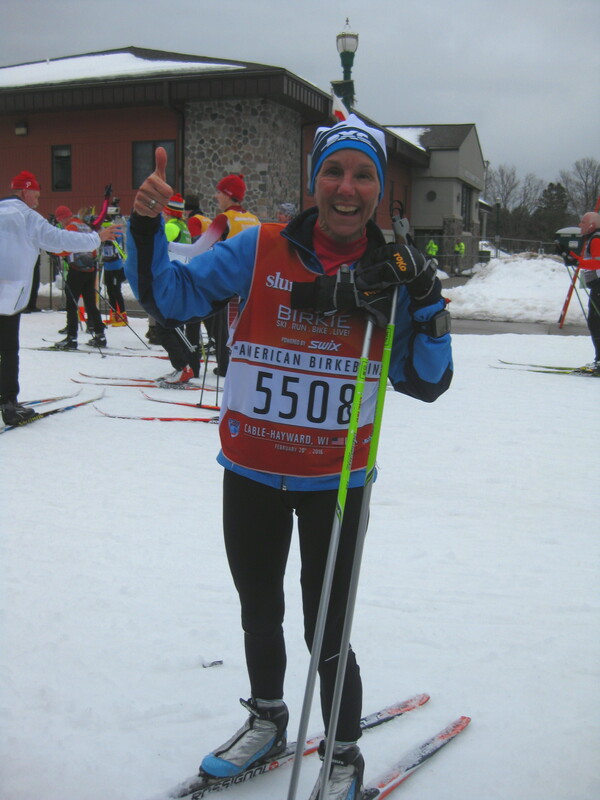 Following a successful finish, I had only a week before the American Birkebeiner. In that time the temperatures soared, rain soaked the area for most of the day before the race, and it never got below freezing that night. Could this be the same climate? This time my concern was how few layers to wear. How little could I put on and still be warm when I begin to tire near the end of my 52k skate race? Despite the 37 degree temp, the wind felt cold and I decided to err on the slightly warm side. 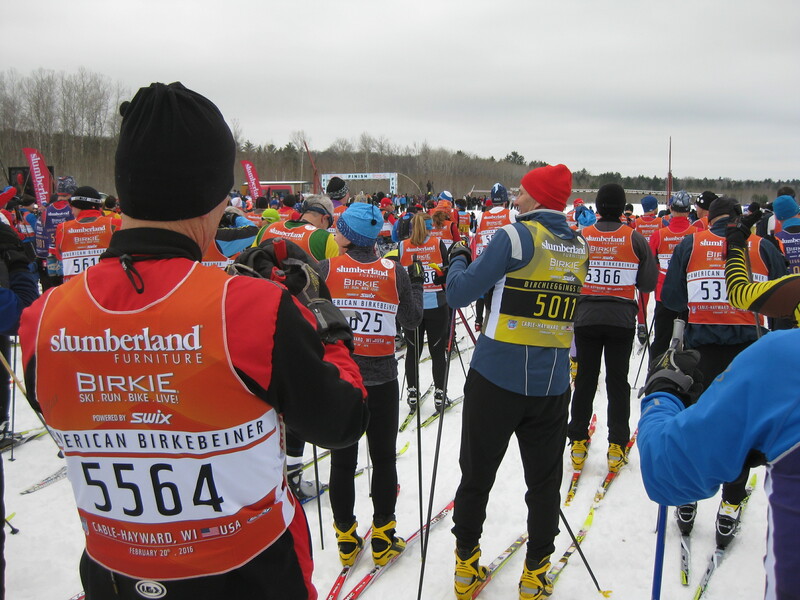 In typical Birkie style, the chute was crowded as I took my place among the 13,000 skiers that day. And I never lacked for company out on the trail. Even though we weren’t looping this time, I was still being continually passed. Perhaps there is something to this age thing after all. Once again the groomers had worked miracles with quirky conditions, but this time the result was slow wet snow. Ranging from soft to mushy, it made me work for every ounce of glide I achieved. Downhills were unpredictable, as my speed varied with the ever changing composition of the snow. But I persevered. Even through the puddles that had formed on Lake Hayward – a final surprise with only 3k left to go. Two races. Two vastly different conditions. But a single outcome. Reaching the finish line. A great sense of accomplishment. And having a good time. 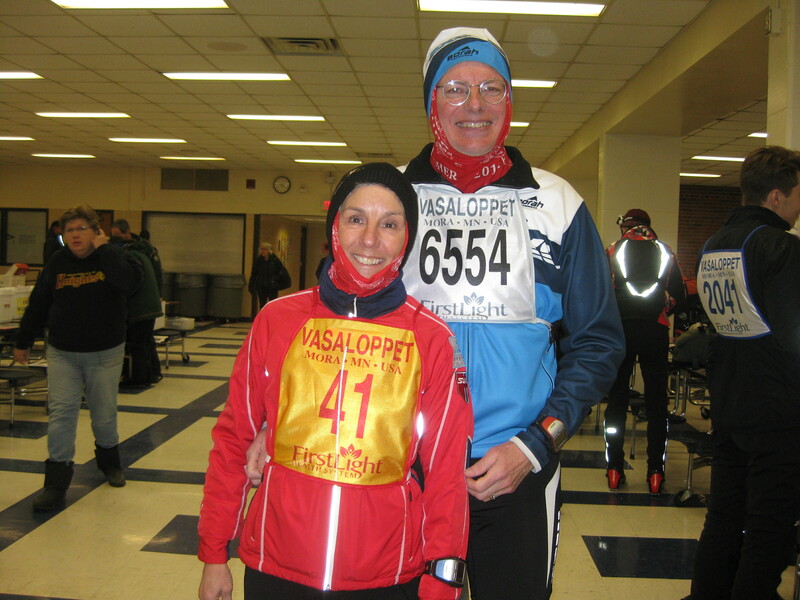 This entry was posted in Keeping Fit and tagged American Birkebeiner, Cross-Country Skiing, Mora Vasaloppet, Ski Races by Molly. Bookmark the permalink. You are truly amazing! Way to go with these 2 extreme races and conditions. You look so happy!